Food sensitivities affect a growing segment of the American public, but food allergens occupy a special space. Gluten intolerance has spawned a growth market in gluten-free foods, with dedicated production facilities being built to cater to it. But the at-risk population for specific food allergies is too small and scattered to trigger similar investment. Yet the danger to people with compromised immune systems is severe enough to warrant special attention in food processing and to elevate allergen control to a par with pathogens, radiological hazards and parasites. 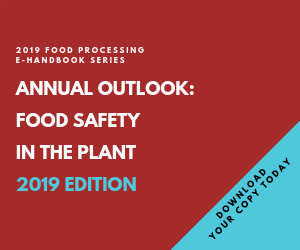 Preventive controls rules in the Food Safety Modernization Act (FSMA) specify plants must have an allergen control program, making allergen control a fundamental prerequisite for safe processing. Children account for the majority of the 15 million estimated citizens with food allergies. Protecting them from the eight major food allergens — milk, eggs, fish, crustaceans, tree nuts, peanuts, wheat and soybeans — has been a growing focus of food companies over the past quarter of a century. Despite those efforts, more than 200,000 Americans were hospitalized after adverse reactions last year, a seven-fold increase in that time frame, according to Food Allergy Research & Education Inc., a consumer advocacy group. Negative outcomes highlight the difficulty of preventing cross-contamination. Allergens are protein-based, and besides being smaller than bacteria, proteins cannot be destroyed with thermal treatment, a key element of most cleaning and sanitizing routines. Processing aids can leave trace levels of allergens, and they turn up in unsuspected products. As part of an enhanced surveillance initiative, the Canadian Food Inspection Agency gathered a sample of 196 bottled beers and tested them for egg, beta-lactoglobulin and casein residue. Egg and milk-based fining agents are sometimes used to clarify beer prior to bottling, and beta-lactoglobulin was detected in one of the beers at a level of 190 parts per billion. Swabs and other tests usually are calibrated to detect proteins in the parts per million, and a zero tolerance for allergens would be impractical and virtually impossible to attain. But establishing acceptable thresholds remains an elusive goal, leaving food processors with little guidance on what constitutes an effective control program. Undeclared allergens and cross-contamination with those proteins account for about half of all food recalls. Given allergen control’s priority status under FSMA, Donald Schaffner of Rutgers University argues, “It’s got to be more cost effective to control them on the front end” than to deal with in a recall. To help food companies better manage allergens, a working group on which Schaffner sits, has developed a personnel training curriculum that will be made available when FSMA rules are finalized. The working group includes representatives from USDA and private industry, including firms such as Cargill and PepsiCo, and is part of a joint regulatory/private industry/academia initiative known as the Food Safety Preventive Controls Alliance. Schaffner is not at liberty to discuss the curriculum until after final FSMA rules are published, but the content shouldn’t surprise anyone who has focused on cross-contamination in food production, predicts Dave Irish, manager of the Aggie Creamery at Utah State University and a sanitation expert. “Until the Peanut Corp. of America event, people didn’t give much thought to foreign contaminants in the production environment,” he muses. “That event and recognition of the severe reactions peanuts can cause have sensitized people to the issue.” Any training and reinforcement of best practices is welcome, says Irish. If executing the fundamentals of personnel hygiene can be considered a best practice, contaminant-free clothing and hand and footwear washing would rank as essential tools. As with most good manufacturing practices, gaps occur between recognition of a requirement and its execution. Making compliance easier is sometimes the most effective tactic. Given the ineffectiveness of heat treatment, the goal is removal for both allergens and viruses. Removal suggests human intervention, and staff buy-in improves if the necessary action is made easier. In a study commissioned by Meritech, researchers monitored handwashing behavior at two restaurant locations, one with a conventional sink and soap dispenser and the other fitted with an automatic handwashing machine. Over the course of 22 days, workers using the manual system washed their hands a total of 41 times. When provided an automated wash station, workers washed their hands 1,162 times over 11 days. Automated systems also may be more effective at removing trace levels of allergens. Though Golden, Colo.-based Meritech has not commissioned any clinical studies involving allergens, a recent study using a surrogate for Norovirus concluded the firm’s IC/ELF (infection control/extremely low footprint) handwashing station reduced the presence of microorganisms by slightly more than 4 logs. Meanwhile, regulators and interested parties continue hammering at the permissible-levels issue, trying to set parts per million thresholds that would protect all but the most sensitive individuals from adverse reactions. Permitting incidental presence of trace amounts also would free manufacturers from overuse of “may contain” precautionary label declarations. “Unfortunately with the current system, allergic consumers are ignoring the warnings because there is so little product available that doesn’t have a warning label,” points out Joseph Baumert, assistant professor and co-director of the Food Allergy Research and Resource Center at the University of Nebraska-Lincoln. Striking a balance between a diligent GMP program and the impracticality of zero risk would be in everyone’s best interest, he suggests. In the meantime, storing allergenic ingredients on the lowest warehouse racks and using color-coded scoops, brushes and other direct-contact utensils are the kinds of GMP aids on which conscientious processors must rely. Peanut Corp.s food safety violations look inexcusable.